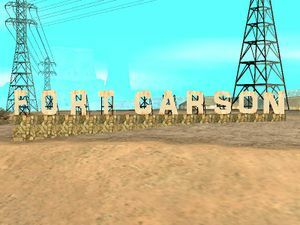 The Fort Carson Sign is a large sign located in the town of Fort Carson, Bone County, San Andreas. The sign is similar to the one found in Vinewood and is a parody of the Hollywood Sign. This page was last modified on 11 August 2012, at 00:06.